Click here to listen to an intrview of me sharing my path of a life of inspiration. I've been following the path of my true inspiration for all of my adult life. It's all about goals, knowing what they are and how to bring them to pass. But it's more than that. It's also about living and working "in the zone" of a truly inspired and focused state. It all began when I met my wisdom mentor back in my early 20's. He taught me the essential principles and practices that I've been studying, applying and sharing ever since. My work changed in a big way when I began teaching my goal achievement formulas to parents and teachers, helping them to achieve their goals with children, with love, and without anger or stress. I began incorporating more and more of what I learned from Maria Montessori into these programs and a whole new dimension of my work opened up. I published my book, Parenting With Love, Without Anger Or Stress and it took off. I even hosted my own show on Atlanta's Radio Disney for a while - it was for kids; I was helping them to raise their parents! My parenting work was soon featured in national magazines and on CNN. Throughout thiis time I was continuing to do professional speaking, empowering corporate groups and associations with my the zone" goal achievement keynotes and seminars. One of the most inspiring groups for me to reach are parents facing the most sever life-challenges, including homelessness, recovery and incarceration. They are literally starving (spiritually) for the goal mastery principles and practices applied by the world's highest achievers. I show them not just how to apply these formulas to overcoming their adversities, but how to pass on the empowerment of goal achievement wisdom to their children. I do much of this work pro bono, and if you belong to or know of any community service organization serving thsse groups, please let me know. I'm a true writer in my heart and soul. I really can't stop. My topic is the wisdom of how to guide our lives along the lines of our true life-purpose and free ourselves from the negativity that gets in the way. When I'm not writing about this, I'm speaking or coaching on it, or reading it, or listening to others share their perspectives on it. It's who I am. 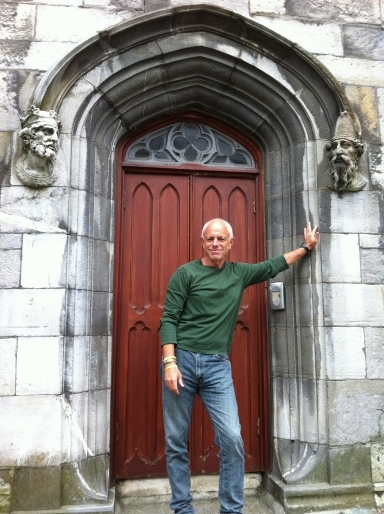 I love traveling the U.S. and overseas sharing my message with anyone who will listen. In addition to wisdom writing I love classical literature and art, roots music of all genres the theater, and nature. 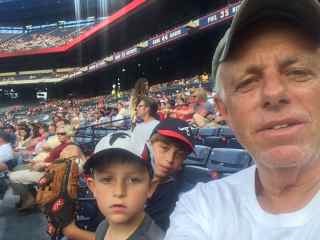 I currently live in Decatur, GA with my two sacred sons - Gabriel (blue hat) and Aaron (white hat), pictured here at a Braves game at good old Turner Field.